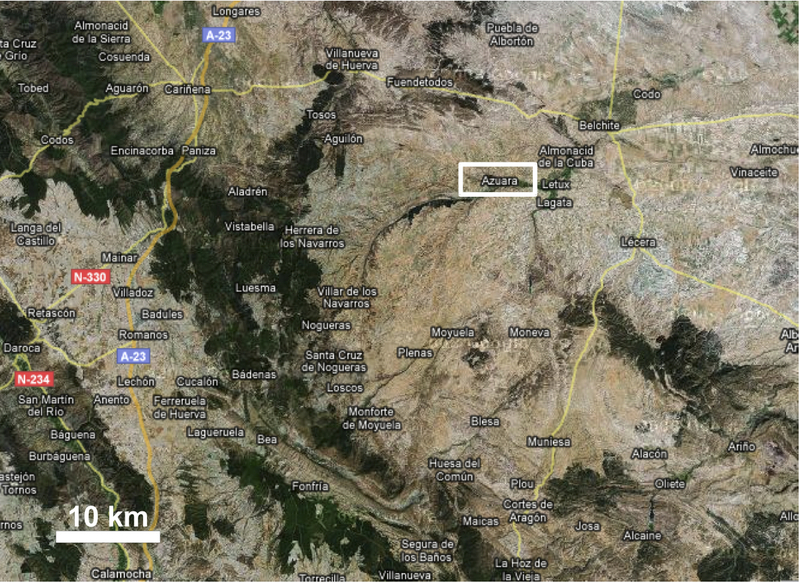 As can be seen in the Google Earth map (Fig. 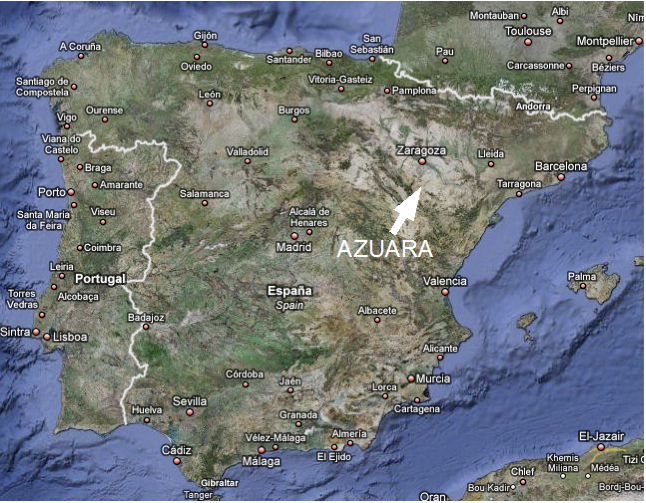 1), Azuara and the impact structure named for that small town are located at the margin of the Ebro basin roughly 40 km south of the Zaragoza province capital. On a larger scale (Fig. 2), the Azuara structure is seen to be located also at the north-eastern margin of the Alpine folded Eastern Iberian mountain chain. The western chain can be seen at the left image margin with the carretera nacional N-234 bypassing the very nice town of Daroca. Fig. 1. Location map for the Azuara impact structure. Google Earth. Fig. 2. Google map of the Azuara area. From space (Fig. 3), the Azuara structure to some extent shows as a circular structure with a distinct morphological ring in the northern part. Extrapolation of the ring corresponds with roughly 30 km diameter. The whole structure is suggested to be much larger which is indicated by an exterior broad zone of enormous rock destructions in detailed described on this website. A 40 km-diameter Azuara structure may rather apply. Fig. 3. 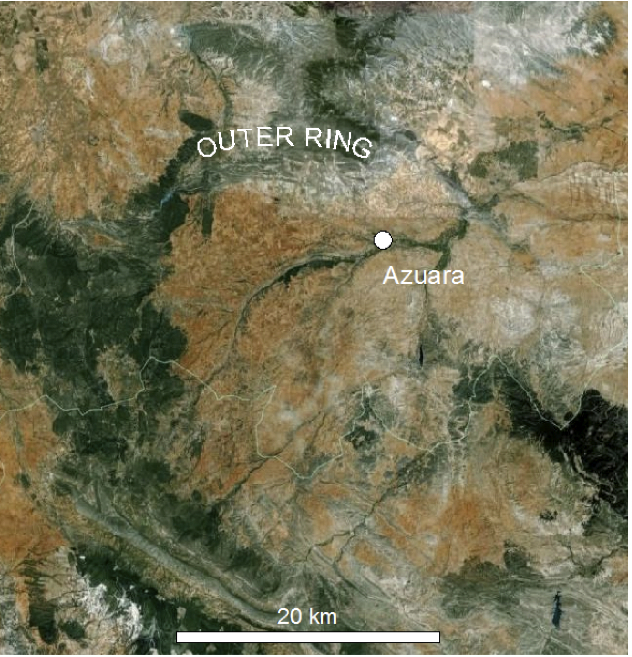 Satellite imagery of the Azuara structure displaying the prominent outer ring zone. Google Earth. As early as about 20 years ago, the late Johannes Fiebag, who pioneered the geological investigation of the Azuara structure, already used satellite imagery for structural investigations in the Azuara area. From lineation analyses (Figs. 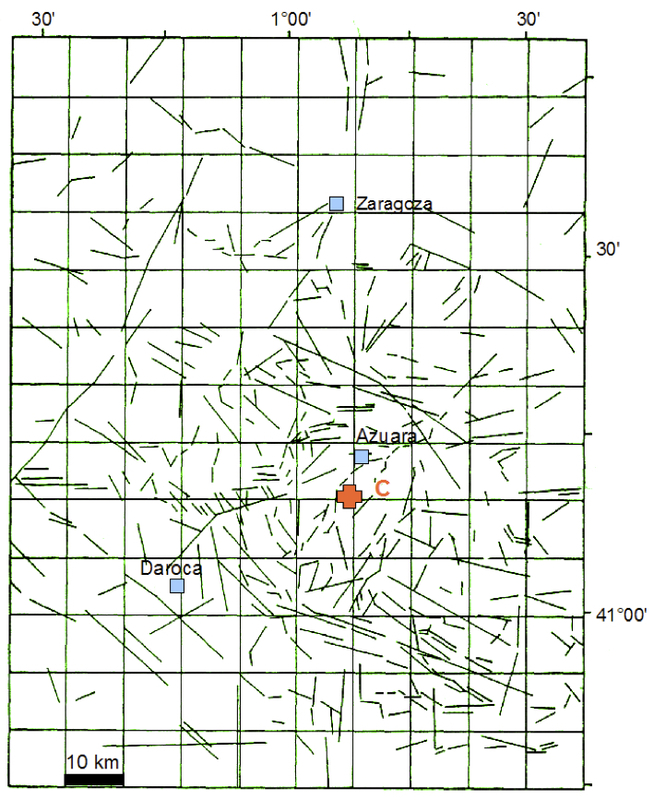 4, 5) he was able to show that the Azuara structure is a kind of foreign matter in the regional geologic signature (Fiebag 1988, doctoral thesis). He elaborated a concentration of radial and concentric elements and a significantly enlarged density of fracture pattern obviously related with the Azuara structure. Fig. 4. Lineation analysis for the Azuara region based on satellite photography (DFVLR, 1 : 530,000). Modified from Fiebag (1988). C = center of the Azuara structure. Fig. 5. 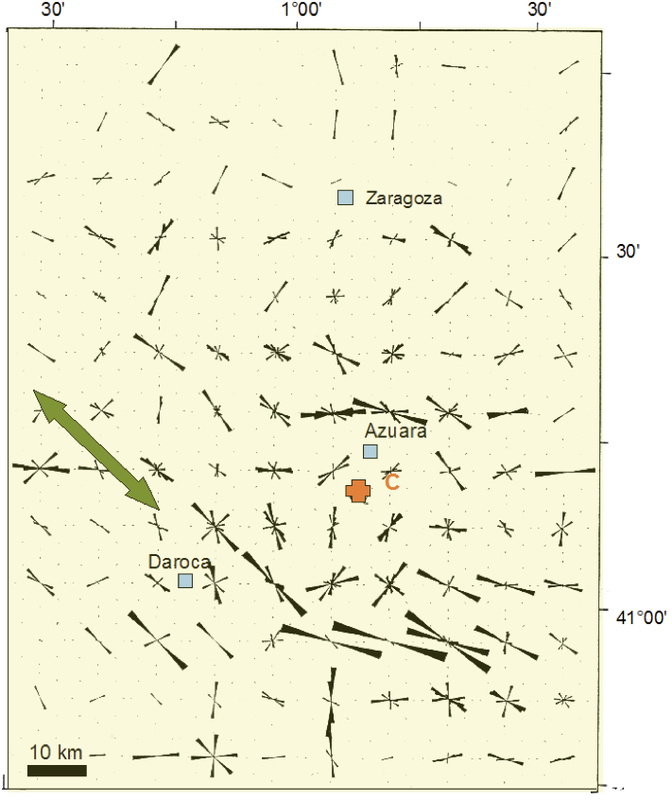 Lineation analysis for the Azuara region: Rose diagrams for 10 km x 10 km squares. Modified from Fiebag (1988). The green arrow corresponds to the general strike of the Eastern Iberian Chain.